Meade Colour Filter Set #1 1.25"
(a) Irradiation is the fuzzying of a boundary between lighter and darker areas of the Moon or a planetary surface and can be caused either by the effects of highly contrasting light impacting the human eye or by the motion of the Earth’s atmosphere, through which the observation is being made. The use of a Meade Series 4000 color filter can mean the difference between seeing small craterlets in the floor of Clavius on the Moon and not; it can mean the difference between seeing five or six whirls, festoons, and loops in Jupiter’s north equatorial belt and seeing one or two; it can mean the difference between seeing the inner crépe ring of Saturn and not. Depending on atmospheric conditions on both the Earth and the planet being observed, the advantages of color filters can be anywhere from subtle to dramatic. Meade Series 4000 filters are a large 26mm in clear aperture and are manufactured from the purest crown optical glass, dyed-in-the-mass (not “color coated”); there are no finer filters available for telescopic applications. Each filter glass is anti-reflection coated on both sides and is mounted in a machined aluminum cell with the Wratten No. of the filter marked on the side of the cell. 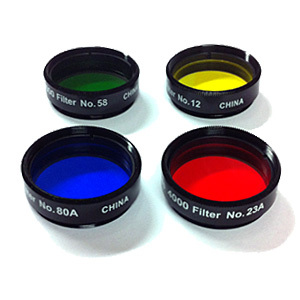 Filters may be piggybacked, or stacked, to achieve selective filtration of the visual color spectrum. For visual applications Series 4000 filters thread into the barrels of all Meade 1.25" eyepieces, and into the barrels of virtually all other 1.25" eyepiece brands as well. The eyepiece-with-filter can be placed in the eyepiece-holder of a Schmidt-Cassegrain telescope or Meade ED Apochromatic Refractor for Tele-Extender eyepiece-projection photography of the Moon and planets. The filters also thread into the barrels of the Meade Camera Adapter (1.25") and Variable-Projection Camera Adapter. Each Series 4000 filter is packed in a foam-fitted plastic case for secure long-term storage. #Includes #12 Yellow, #23A Light Red, #58 Green, and #80A Blue.